Happy Bloggers Challenge Friday, I'm so glad you stopped by today! For the last few days the weather has been wonderful! Just like Spring should be, but this weekend all that will change as we go from near 70 degrees and sunny to 39 degress and snow! So much for this weeks Bloggers Challenge Theme - Think Spring! Hopefully with all the challenge members posting their springlike creations it will bring back the warmer weather. In my house Spring is a sign it's Fishing Season (more on that another day). When I think of Spring, I think Flowers, Birds.....and Beautiful Butterflies! If you've stopped by my blog before, you know the majority of techniques I use come from the Technique Junkies Newsletter, today's card is no exception I'm using the Mono Dies Technique. The Embosslits Beautiful Wings is just perfect for this technique. My focal image is from Kitchen Sink Stamps 3 Step Butterlies, stamped on White, then cut using the Out of the Box Technique, I added some dots with a White Gel Pen to help pop the image a bit. Then sentiment is from Kitchen Sink Stamps Vintage Words. Did you know that the TJNL Design Team Blog is now hosting weekly challenges using techniques from the newsletters? But that's not all, every time there's a TJNL challenge posted, Pat will put the issues from the year it comes from on sale for HALF PRICE! * Instead of $18.00, you will be able to purchase the entire year that the technique is from for only $9.00 (plus actual postage). How cool is that! Thanks so much for stopping by! Be sure to click on the Bloggers Challenge Logo on my sidebar to see what the other players created this week. If you'd like to play along, just leave a link to your project in the comments, I'd love to see what you created! Pretty card! Isn't that butterfly die great?! Stunning, Lisa! Love what you did with the embosslits, the ink added really gives each butterfly depth! I just got this embosslits die yesterday and I can't wait to try this technique with it! Awesome card, Lisa (orange is my favorite color)! Simply Marvelous darhling! I love the butterfly, he flew around my room a couple of times! Beautiful, love the tech and the new little b-flies! That butterfly is gorgeous! Love the card! Lisa, that background is amazing. I am SO caseing that for one of my classes!!!! Thanks for the inspiration!! Such a beautiful card! I love butterflies. And the color scheme is so cheery. I'm thinking spring. 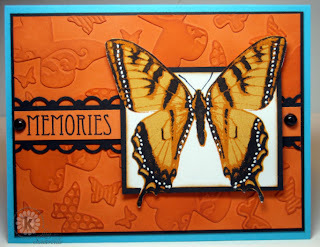 beautiful butterflies, I love this color combo...I just used it for a card yesterday to be posted next week. Ah Lisa, what a charming card, using the embosslits..I really love that stamp...it is calling my name. Wow this is stunning. Love the bright orange and of course who doesn't think butterflies are beautiful. Love the embossing of them. Thanks for the B-Day wishes. I am really loving this embosslit...thanks for inspiration on another way to use it :-). Great card! What a stunning card!! Just gorgeous! I love the colours you've used Lisa. GORGEOUS is all I can say. Great colors! STUNNING Lisa - I just love these colors and your card! TFS! Beautiful, Lisa! Love the dimensional look of the background, too. Wow, Lisa...the butterfly looks like it could fly right off the card! Awesome job with coloring and the technique! Looks like snow will go north of us...thank heavens! Very pretty! The butterfly embosslit is perfect for the background. The background is awesome for this image, but I would have sworn this was a real butterfly. Great job of coloring -- it still looks real to me and I know how you did it. Great image! WOW! I love that background technique, as well as the butterfly image. perfect colors for the 3-step! What a beautiful card Lisa!! I love what you did with the butterflies in the background!! Great technique that I need to try!! And a sign of Spring in our house is softball. Boys and their sports!! Great card!! I love it! That butterfly is GORGEOUS!! It looks so real; beautiful coloring, Lisa! Love that background technique with the butterflies! Lisa, this is just stunning! I am so sorry I have missed the last three weeks of the challenge. With my mom being sick I am doing WAY too many doctor appointments and other stuff. I hope to be back on track this week. I also missed your birthday! Hope you had a great one! I just love what you did with the butterfly embosslet! Gorgeous, gorgeous card! Yes, bring Spring back! !